We have been vacationing in Colorado this week and enjoying every beautiful nook and cranny we can find. On Thursday, my parents took us on a short road trip to Hanging Lake trail near Glenwood Springs. It was a challenging hike for a novice and we started it right around Ed's nap time. 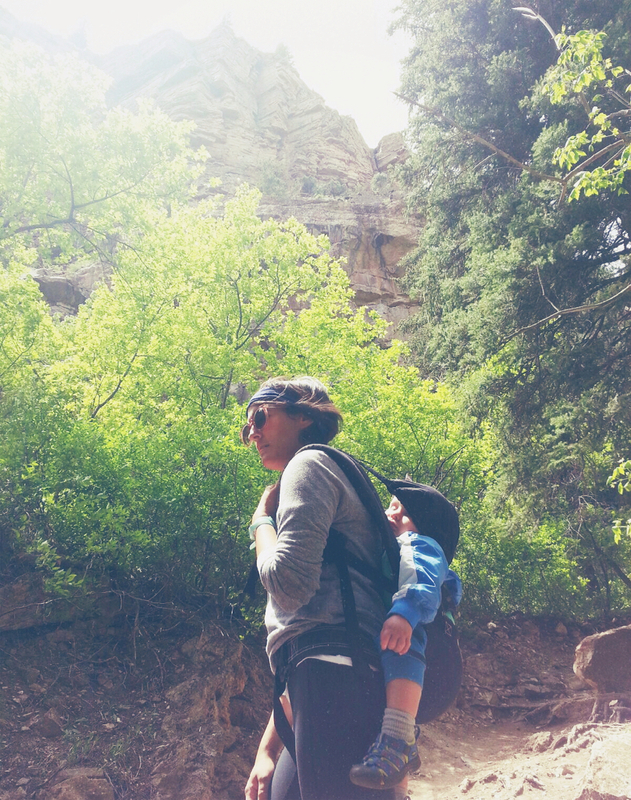 With him strapped to my back like a little monkey in our Ergo, we worked our way to the top as he slept on and off. Every one else in our party offered several times to take a shift carrying Eddy but I just kept on chugging. Maybe it's having carried him in my belly and then pushing him out but I feel a very we're in this together spirit with this tiny human. Papa started the hike down with him in tow but after fussing a bit, I put him back on and off to sleep he drifted again. This week's photo was snapped by Papa with his phone. Lovely photo of your sleeping beauty. I feel the same way! But oh how you make me miss my baby carrier. It has been gone less than a week and this image and your words remind me all too well why I loved it. There is something special about wearing your babe, isn't there? I only wish my little lady would sleep in the ergo. It doesn't matter how tired she is, there is always something to distract and interest her. GREAT photo! Eddy looks quite happy to be carried by his mama. I feel the same way about carrying Paddy. =) All the pics I've seen from the trip looks so lovely! Love it!!! And all that natural environment. Sweet connection! The light is so pretty! I love wearing my babies but haven't tried a back carry yet! Thanks for stopping by Project Procrastinot! Girl, you will have legs of STEEL. I admire you, and I love this photo.